The brethren and guests of Blainscough Lodge No 8532 gathered at Chorley Masonic Hall to witness the installation of Chris Jones. A family affair pictured from left to right, are: Joe Brennan, Chris Jones and Ian Jones. 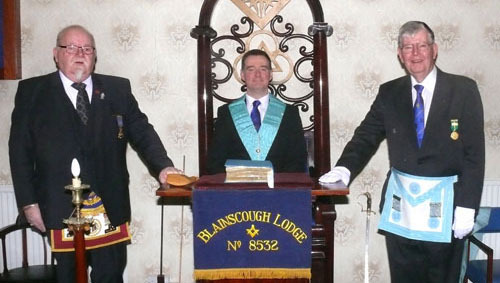 Having opened the lodge, the master Paul Bennet welcomed Ian Jones as a joining member of Blainscough Lodge. This made the ensuing installation a truly ‘family affair’ as Ian is the father of the master elect, Chris Jones. Carrying on the ‘theme’ of a ‘family affair’, Ian took his place in the lodge next to Joe Brennan, the father-in-law of the master elect, a Scottish Mason visiting to witness the installation. The master despatched the business of the lodge before a report was heard and the director of ceremonies entered to announce Assistant Provincial Grand Master David Winder and vice chairman of the Chorley and District Group Peter Allan. They were accompanied into the lodge by 10 acting Provincial grand officers and a number of grand officers. The master Paul Bennet shared the installation with Ian Simm, both contributing to ensure Chris Jones had an installation to remember. The ceremony was very much a team effort, or should we say ‘family affair’, with Steve Corner taking on the role of installing senior warden, Anthony Price, junior warden and Peter Jackson, tyler all under the watchful eye of director of ceremonies Anthony Slater. David Winder (left) presents Chris Jones with a Vice Patron of the MCF 2021 Festival certificate watched by Malcolm Warren. The assembled brethren were treated to three exemplary explanations of the working tools by Joseph Hall who undertook the third degree tools, Ian Taylor in the second degree and Paul Wilkinson in the first degree. In like manner the addresses were delivered by Peter Jackson to the newly-installed master, Peter Allan to the wardens and David Winder to the brethren. 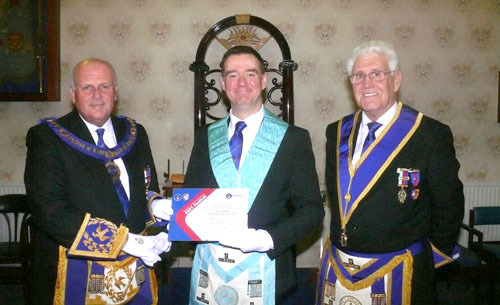 At the conclusion of the installation, Chris Jones took control of the lodge with confidence and presented David Winder with a number of cheques for charity, amounting to £3,700. The recipients were the Masonic Charitable Foundation 2021 Festival to the tune of £1,500, West Lancashire Freemasons’ Charity with £300, Chorley Masonic Hall Association with £500, Masonic Trout and Salmon Fishing Charity with £300, Rosemere Cancer Foundation with £200, Manchester Children’s Hospital with £200, Arthritis UK with £100, Headway with £100, RNLI with £50, Queen’s Lancashire Regiment with £200 and Macmillan Cancer Support with £250. Pictured left: Chris Jones (left) being toasted by Andy Anderson during the master’s song. Pictured right: David Winder (left) receives a present for his wife from Chris Jones. David Winder thanked the brethren of the lodge for their generous donations and then presented Chris Jones with a certificate commemorating Blainscough Lodge having become a Vice Patron of the MCF 2021 Festival. After enjoying a wonderful installation, the Provincial grand officers and grand officers assembled in the upstairs bar to drink to the health of the new master. They then retired to join the rest of the brethren in the main function room where they enjoyed an excellent meal. The master’s song was sung by Andy Anderson who was in fine voice. The only downside of the evening was that all good things must come to an end and the brethren reluctantly took their leave of friends new and old, knowing they had had a very enjoyable evening in each other’s company. Chris Jones with Assistant Provincial Grand Master David Winder and grand officers and acting Provincial grand officers.